Laser Cut Fabric is a part of Laser Cutting Shapes and provides laser cutting services for textile and industrial fabrics. LOCATION: We are located in Columbus Ohio and we service clients across the United States and Canada. INDUSTRIES: Company has substantial experience servicing various industries including automotive, medical devices, furniture, fashion, and others. MATERIALS: Various woven and non-woven fabrics, organic such as silk, wool, cotton, leather etc, and artificial such as polyesther, nylons, acrylics, neoprene, rubber, vinyl leather etc. PROJECTS SIZES: There are no small or big projects that we will refuse. QUALITY: We run the best laser cutting systems in this industry providing a high level of intricacy, repeatability and quality. LEAD TIMES: In general our lead times for the average project is 5-10 days. In some cases we have done urgent projects within a day. Check the latest trends coming from the runways and you will see many fashion elements being cut with lasers. 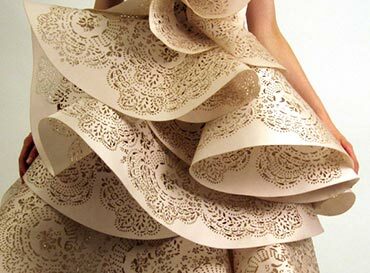 Lately we are seeing a growing demand for laser cutting textiles by top designers. Our customers are coming from many different industries with many different applications. Please read below the benefits of using lasers. Lasers are able to cut the most detailed patterns you can imagine. You can send us any vector file, or we can develop one for you from a drawing. Please see our "setting up a sketch" page for more details. We can also help you with your layout to get the most yields from your expensive textiles. Lasers are able to cut the most detailed patterns you can imagine. You can send us any vector file, or we can develop one for you from a drawing. Please see our "setting up a sketch" page for more details. We can also help you with your layout to get the most yields from your expensive textiles.Lasers are able to cut the most detailed patterns you can imagine. You can send us any vector file, or we can develop one for you from a drawing. Please see our "setting up a sketch" page for more details. We can also help you with your layout to get the most yields from your expensive textiles. If you are cutting with shears or blades, you know that some fabrics tend to fray. Laser cutting seals the edges of most textiles virtually eliminating the problem of fraying. This opens the door to limitless new techniques with textiles.If you are cutting with shears or blades, you know that some fabrics tend to fray. Laser cutting seals the edges of most textiles virtually eliminating the problem of fraying. This opens the door to limitless new techniques with textiles. Cutting precisely with scissors or blades can be very challenging, especially if high volumes are needed. With laser cutting (even on leather), you can have repeatable clean cuts with a precision unachievable with shears or blades.Cutting precisely with scissors or blades can be very challenging, especially if high volumes are needed. With laser cutting (even on leather), you can have repeatable clean cuts with a precision unachievable with shears or blades. Laser Cutting Shapes can cut 51" wide and endless lengths limited only by the length of your roll of fabric. We can also cut / etch large rawhide skins right on our laser bed.Laser Cutting Shapes can cut 51" wide and endless lengths limited only by the length of your roll of fabric. We can also cut / etch large rawhide skins right on our laser bed. If you work with textiles, you know how difficult it is to achieve consistent results when cutting certain materials with conventional methods. It''s almost impossible to cut the same shape every time. Lasers offer precise cuts whether you are cutting 10 shapes, 1,000 shapes, or 10,000 shapes. The cut is the same every time.If you work with textiles, you know how difficult it is to achieve consistent results when cutting certain materials with conventional methods. It''s almost impossible to cut the same shape every time. Lasers offer precise cuts whether you are cutting 10 shapes, 1,000 shapes, or 10,000 shapes. The cut is the same every time.